Runs To Get Waisted: I'm a Loser Baby! So today was weigh in day, and cue a big George Takei "Oh MY". I lost 3.6 pounds last week, which is honestly unbelievable considering how much sodium I consumed yesterday! That is 9.2 pounds lost since October 15, and I'm sure some of it is water weight, but still. As exciting and motivating as it is, I'm wondering if I should up my calories just a little since I don't want to lose too much too fast. I think an extra 200 a day or so would be appropriate since I have been very active, so I may tweak it to see how that affects things. I also lost another 2.5 inches total, so yay me! I lost half an inch from both my waist and hips, so maybe that Richard is working his magic! Speaking of Richard, I had a double dose of him today with STTO and the Stomach Formula Day 6. I can't believe that I've almost completed the whole week, but then I get to do it again for 2 more weeks! And Molly has started doing this annoying thing where she jumps down and gets in my face while I'm trying to do my ab workout. I literally clocked her in the jaw today on accident because she chose to do this right as I was in the middle of this halfway seated twist move. 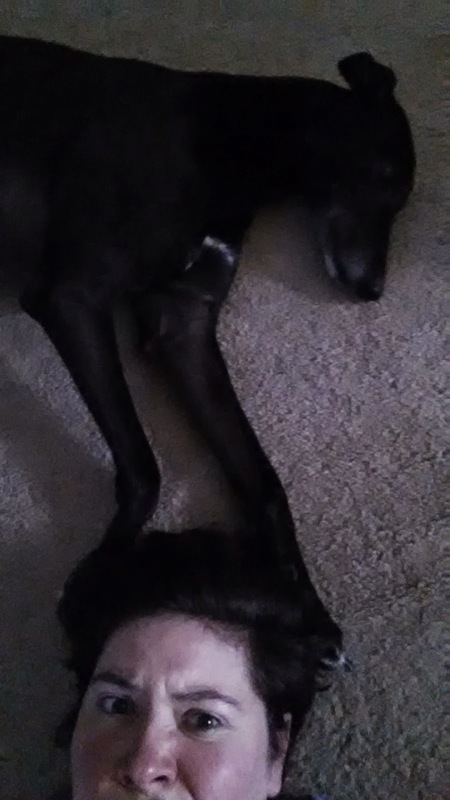 Then she decided to lay behind me with her paws touching my head. This dog is so ridiculous. And please forgive my Kim Jong-un hair, growing it out has been trying to say the least. Usually I am pretty excited to "fall back" for daylight savings, but I have to admit that the time change has really messed me up. I haven't slept well for the last two nights, and it's also thrown off my eating. I was so hungry for lunch at like 10 am that I had to tide myself over with an apple and some PB! Tomorrow is a little bit of a D Day because I'm going back to my doctor to get my blood pressure checked and probably get a refill on my meds. I admit to being an awful person and not getting my BP checked between the last time I went (Julyish?) and now. I know it's very serious and I should get it checked more. I am really hoping that the medicine has helped and that with the dietary changes that maybe it's even lower. Unfortunately with my family history, I don't know if I will be able to get off meds, though I'd like to think that maybe someday when I lose enough weight and have a healthier frame that it could be possible. Awesome job on the loss! Love the puppy being all up in your business.